My name is Aubrey and this is my pit bull family. I'm a stay at home mom of 3 great kids (all under the age of 9). My husband Rick and I got our first pit bull 3 years ago. Her name is Ava. Ava is solid white with a brown diamond patch of chocolate over her right eye she was found in a ditch at 1 week old by a friend and came to live with us at 5 weeks, she was the smallest little baby, so cute. Now she is 3 and the best dog ever. The funniest thing she does, and has some how taught our other 3 to do, is roll over on her back and just kick her back legs like crazy. We call it the Woo Woo Dance! I couldn't imagine my life without her. Ava was the first pit bull in our entire family and now just between our parents and brothers and sister we now have about 10 full blooded pit bulls and we love every single one of them! All of this is thanks to Ava, she has changed so many minds about pit bulls, that family members that said they would never have a pit now do, and I love it. This is the best breed ever!! Our second is Capone, he is a solid very light, blue fawn...so beautiful. He is really cheesy, loves to jump on the trampoline with the kids and do the army crawl, he can do that all day. We got him from a very good breeder so we had no problems with him. The funniest thing is does is SMILE!!! All teeth showing, running full force at you. He has scared a lot of people, but once they know he is just smiling they cant help but love him, and he loves everybody just as much. He's a momma's boy too. The other 2 are babies that Ava and Capone had together, now 1 year. Frankie is our crazy, full of energy and kisses, loves to give kisses. He is a red fawn and a very big boy, another momma's boy. And last but not least, is our little miss Khloe. She is a solid chocolate with white chest and white toes. 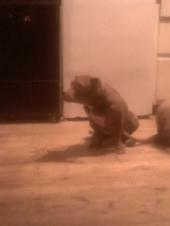 She is the runt of her litter and only stands about 15 inches tall, if that. I call her momma's lil left over's. For a long time we didn't think she would grow. 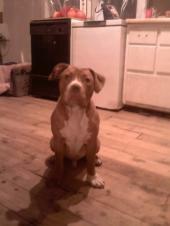 But now she funniest looking pit ever. My sister says she has shrek ears and an Elvis grin. The Elvis grin she has, only seems to get one side of the lips up.